Behind the Bit: What mares cross best with Quaterback? What mares cross best with Quaterback? That said, I would say that a typey mare, maybe one with "blood" would suit Quaterback best. 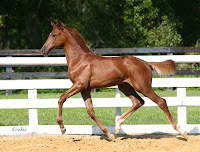 In the Hanoverian region, some of the foals (that I have seen) out of the more old fashioned mares were somewhat normal. But, temperament wise, I would not use a spicy or difficult mare hoping that Q'back would tone her down. The foals are VERY intelligent and quite engaged in their surroundings. They have above average energy, which adds to the power of their movement. And I think this quality will also make them good competition horses for those that know how to train and deal with this type. Judy sent along some pictures as well. The photo top right is Quetzal out of Reina H (Rubinstein - Herbststurm (TK.) - Boris (TK) - Pregel (TK)). The top left is Qredit out of Reina H's daughter, Dream Rubina by Dream of Glory. The first foal of the season is due Christmas Eve. You can check the News section of the Yancey Farms Web site for pix and info. I know I'll be looking for some pix! Stacey...thanks for the comment. Yes Target reminds me of your horse too. Are you starting to have the snow that we are getting? How did you find my Journal? Nice baby photo!!! Everything looks perfect to me. A breed of horse that crosses well with Hanoverians are Quarter Horses.